MOSCOW, Russia -- World heavyweight champion Vladimir Klitschko retained his WBA, IBF, WBO and IBO titles with a unanimous points win over Russia's Alexander Povetkin on Saturday in Moscow. Ukrainian heavyweight boxing world champion Vladimir Klitschko (L) celebrates his victory over Russian Alexander Povetkin. The Ukrainian champion enjoyed an emphatic victory in his 24th world title fight having put Povetkin on the canvas five times, three times in the seventh round alone. This was Klitschko's 61st victory in his 64th professional bout, in front of a 14,000-strong crowd, having earned his first world title back in 2006. "That was a tough bit of work, he's a real fighter," said Klitschko. "I kept landing the punches, but he stayed in there." "I believe it was a deserved win, but I think I can improve still." 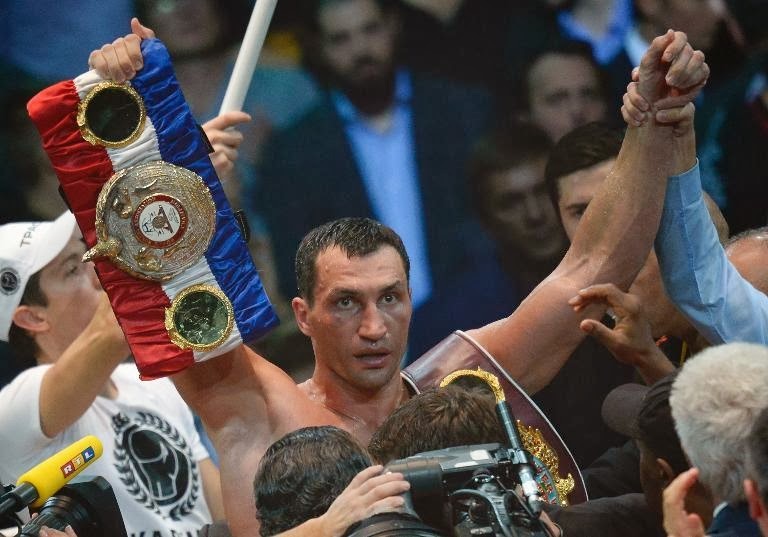 With both fighters having come into the fight with a World Boxing Association heavyweight belt, 'super' champion Klitschko made it clear who is the best in the world. "Things didn't quite go as well as I wanted, but I never give up," said Povetkin. "Of course, he was the better fighter, he's the best in the world, that's clear." After a bright start, Povetkin hit the canvas in the second round after a sharp left hook from Klitschko, who weighed in at his lightest weight for four years, but the Russian was soon back on his feet. Klitschko slowly took the initiative in the third and fourth, as he started to use his jab to effect with Povetkin's right eye starting to bruise. The champion seized control in the seventh round when Povetkin went down three times. A left-right combination put Povetkin back on the canvas and although he survived the count, a fierce follow-up from the Ukrainian had the challenger down twice more. Povetkin went down for the fifth time in the ninth, although referee Luis Pabon ruled it was a push from Klitschko. Povetkin's face was puffing up, but Klitschko looked fresh in contrast as he chased his 52nd knock-out, picking off shots with his left at will. But Povetkin came out with all guns blazing in the last two rounds and caught the champion with a good right in the 11th, while Klitschko had a point deducted for pushing Povetkin over again. The Russian was again put on the canvas in the 12th and the pair exchanged blows even after the final bell. The clash at Moscow's Olimpiyski Arena was a battle of the former Olympic super-heavyweight champions. Povetkin won the Olympic gold at the 2004 Athens Games, eight years after Klitschko's victory at the 1996 Atlanta Games. Povetkin suffered his first defeat having come into the fight with an undefeated record with 18 knock-outs in 26 wins, while Klitschko has 51 knock-outs in 61 wins with the last of his three defeats having come nearly a decade ago. Both fighters walked away with a small fortune, with Klitschko making a career-high 13.13 million euros ($17.1 million) and Povetkin 4.4 million euros ($6.0 million).